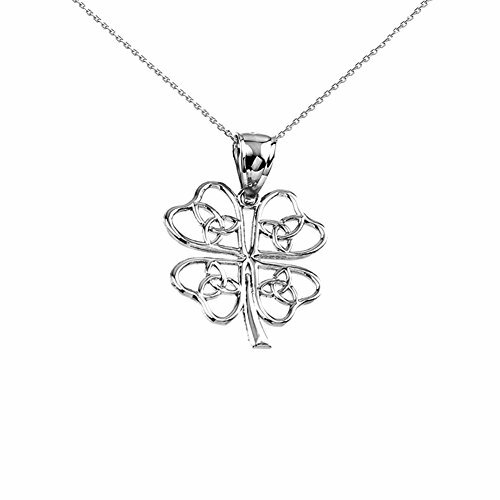 This Sterling Silver Cubic Zirconia 4-Leaf clover pendant necklace is stylish and classic. 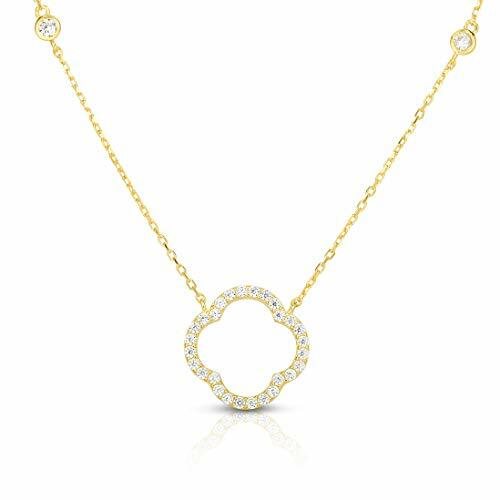 The Cubic Zirconia stones are pave set and give an utmost light and spark to this magnificent necklace. 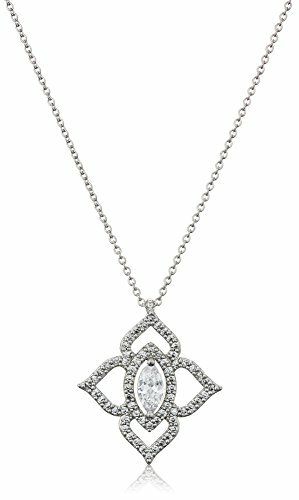 In addition, there are 2 accent CZ stones bezel set that symmetrically come down on both sides of the necklace. The Geometrical Design, a 4 Leaf Clover that is inspired by the Alhambra of South of Spain, is enhanced and circled by the magnificent row of Cubic Zirconia stones. The four leaves represent hope, faith, love and luck. Enhance your fortune by acquiring this symbol of good luck. This magnificent pendant necklace is part of our popular CAPE COD BEACH() line of Jewelry. 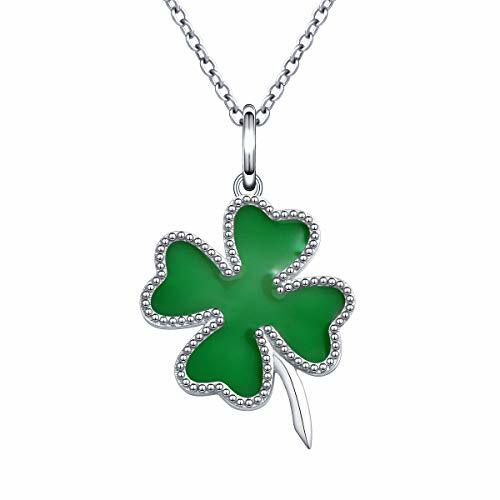 This Sterling Silver Cubic Zirconia 4-Leaf open clover is stylish and classic. It is durable and strong due to its links' formation and strength. The Cubic Zirconia Stones are prong set and give an utmost light and spark to this magnificent necklace. The Geometrical Design, a 4 Leaf Clover inspired by the Alhambra of South of Spain, is enhanced by the magnificent row of Cubic Zirconia stones. Enhance your fortune by acquiring this symbol of good luck. 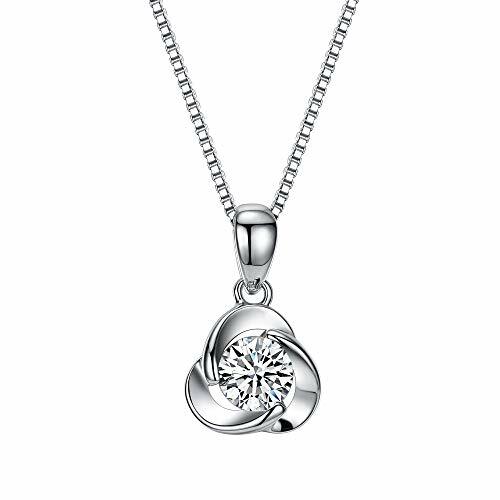 This Sterling Silver Cubic Zirconia 4-Leaf open clover pendant necklace is stylish and classic. The Cubic Zirconia stones are prong set and give an utmost light and spark to this magnificent classy necklace. The Geometrical Design, a 4 Leaf Clover inspired by the Alhambra of South of Spain, is enhanced by the magnificent double row of Cubic Zirconia stones. Enhance your fortune by acquiring this symbol of good luck. VANA JEWELRY Brand Introduction VANA JEWELRY aims to provide women with exquisite, high-quality and independently designed jewelry. We hope our jewelry will make you more beautiful and confident. We are truly grateful for your selection. Show the originality by details This necklace is polished elaborately to maintain the smooth appearance. The surface is plated by platinum to slow down the oxidation of silver for more gloss, making the earrings durable and shining. Give a unique surprise in every special day as the memorial to show your love. 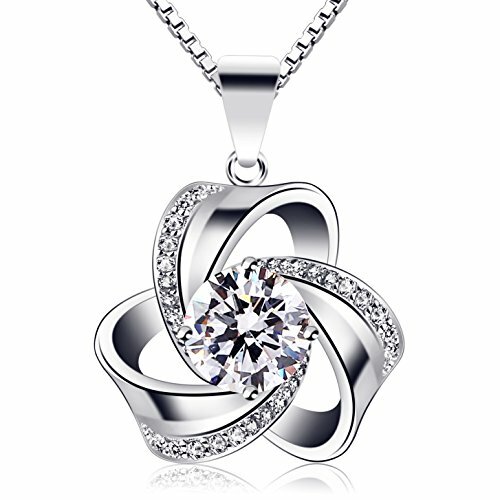 It's best to choose the necklace of Lucky Clover for who you love. 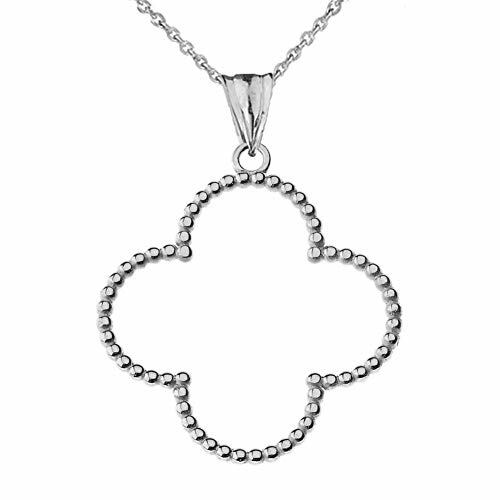 This fine 925 sterling silver Four-Leaf Clover charm showcases the artistry and beauty of our handcrafted jewelry. Open your world to the power of positivity with little charm and a lot of meaning. The Make A Wish collection brings lovable icons with lasting messages together.Wear this necklace as a reminder to be your own kind of beautiful. Make your own rules, trust your instincts, and do what makes you happy! 925 Sterling Silver Vintage Green Heart Lucky Four Leaf Clover Pendant Necklace for Women Girls St.Patrick s Day Gift, 18"
925 Sterling Silver Open Design Trinity Knot Lucky Four-Leaf Clover Pendant Necklace, 18"
This fine 925 sterling silver Four-Leaf Clover pendant necklace showcases the artistry and beauty of our handcrafted jewelry. 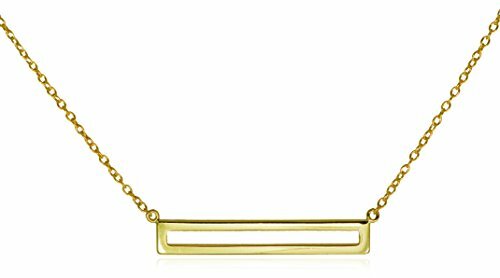 This Chic and Elegant Open Design Horizontal Bar Necklace is perfect for everyday wear, exclusively from GLITTER LOUNGE. You are sure to turn heads in this winning item, formed out of solid .925 Sterling Silver Gold Tone high shine mirror finish. Makes a perfect gift for a Birthday, Anniversary, Valentine's Day, Mother's Day, or Bridesmaid present. FREE Gift Wrapping: Your necklace will arrive in a beautiful satin textured Jewelry Box, ready for gift giving. This simple yet meaningful piece of jewelry they will become a new favorite and stay luminous for a lifetime. NO RISK ::: 30 Day Money Back Customer Satisfaction Guarantee. Description Brand Name: B.Catcher; Material: Sterling Silver; Identifier: S925; Weight: 4.55g; Size: 21mm*15mm; Necklace: Box Chain; Stone: Cubic Zirconia, 6mm. About B.Catcher Jewelry B.Catcher Jewelry is the beauty catcher who creates fine and fashion jewelry out of Silver, Stone, Pearl: catch the eye and capture the heart. B.Catcher Jewelry chooses the best materials with distinctive design and meticulous cut, presents a fashion style.It is your perfect choice. Material&Quality: Rhodium-plated 925 Genuine sterling silver & AAA-quality CZ stones with meticulous cut gives a shiny white gold fashion look. Passed strict skin test grants allergy free, nickel-free and lead-free; Jewelry box included makes it perfect gift. Warranty&Support: We provide 90-day warranty and please email us if you have any questions. Note: The image may show slight differences to the actual item in size,color and texture. 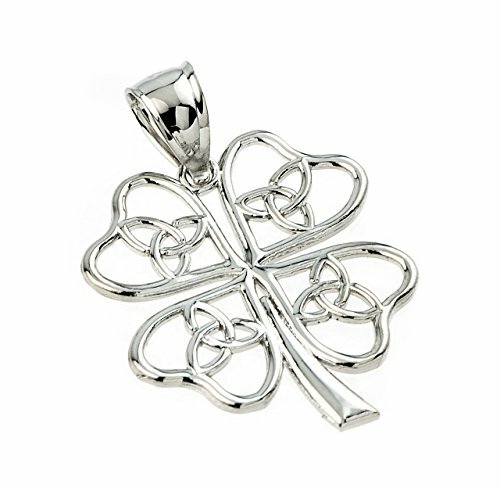 This fine 14k white gold Four-Leaf Clover charm showcases the artistry and beauty of our handcrafted jewelry. 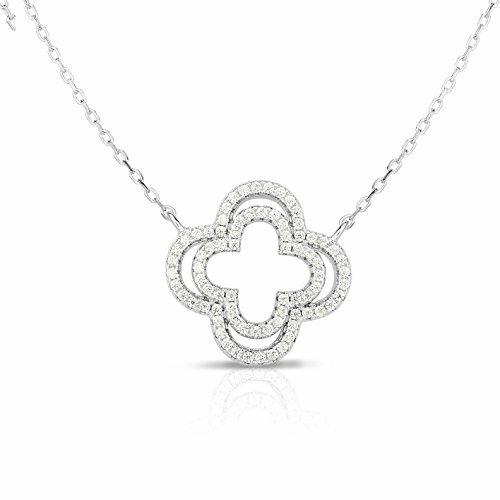 This fine 10k white gold Four-Leaf Clover Pendant showcases the artistry and beauty of our handcrafted jewelry. Fine Sterling Silver Beaded Open Four Leaf Clover Pendant Necklace Large (1.3"), 22"
This fine sterling silver large open design Four Leaf Clover pendant showcases the artistry and beauty of our handcrafted jewelry. With its simplicity and nobility, this stunning piece of fine jewelry has become one of our best sellers. 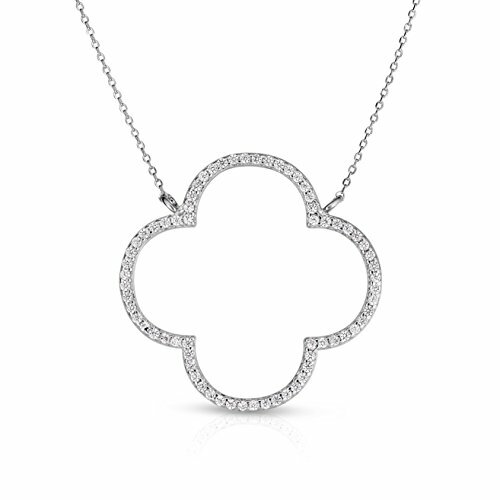 The clover pendant is also associated with the Irish tradition, more specifically the celebration of St. Patrick's Day.Individually hand polished to a lasting high sheen polish finish. This pendant is both of unsurpassed quality and impressive design. 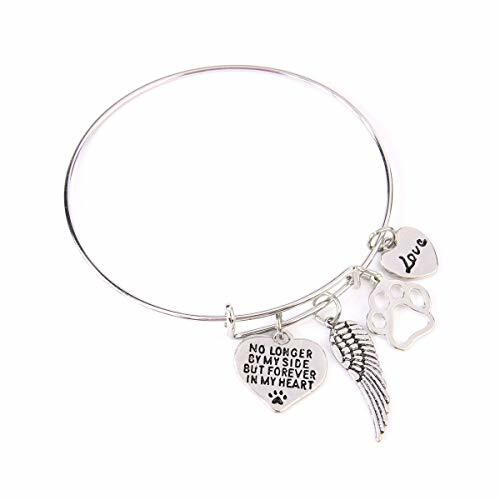 Cute and trendy bracelets featuring dangling charms with etched messages. You can add these along with other accessories to create a unique arm candy! 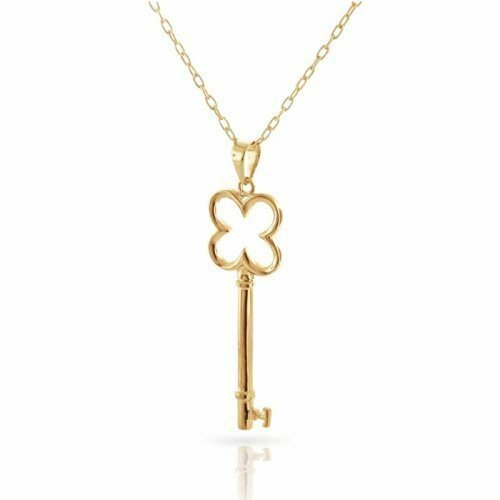 This Inspired clover key pendant is made out of .925 Sterling Silver and plated with Gold Plated. 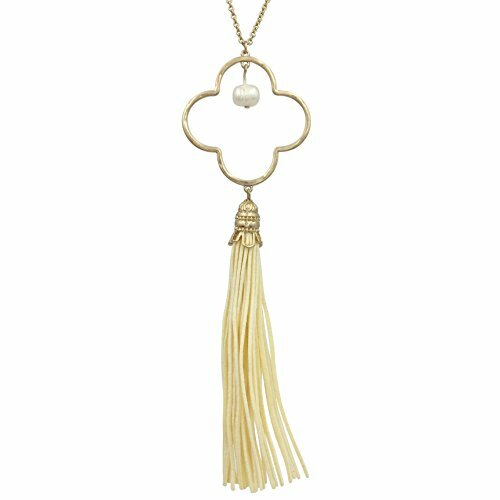 The centerpiece of this key pendants is the finely crafted four leaf clover made with a smooth gold design. Get this lucky pendant for yourself. 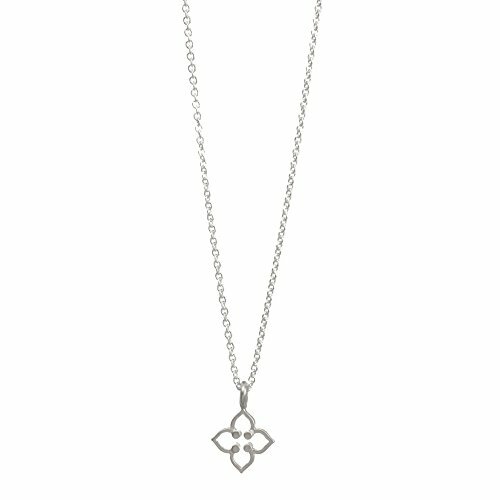 Enjoy the luxury of this quatrefoil four leaf clover key pendant. Wear with jeans or your favorite dress for a lucky ensemble. Indulge yourself today or surprise a loved one. Makes a great gift for any holiday. This key pendants comes with an 18 inch gold chain. This Sterling Silver Turquoise 4-Leaf open clover necklace is stylish and classic. It is durable and strong due to its links' formation and strength. The Turquoise stones are prong set and give an utmost light and spark to this magnificent necklace. 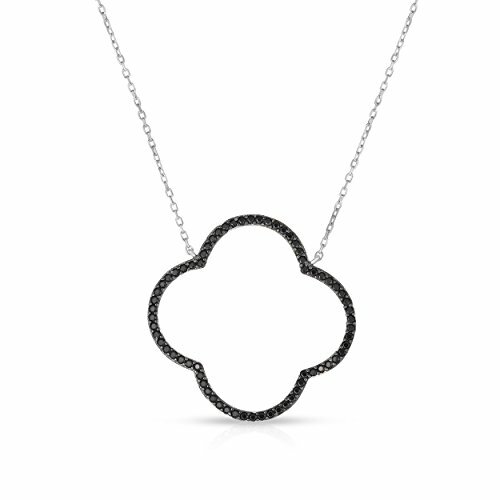 The Geometrical Design, a 4 Leaf Clover inspired by the Alhambra of South of Spain, is enhanced by the magnificent row of Simulated Black Onyx stones. Enhance your fortune by acquiring this symbol of good luck. 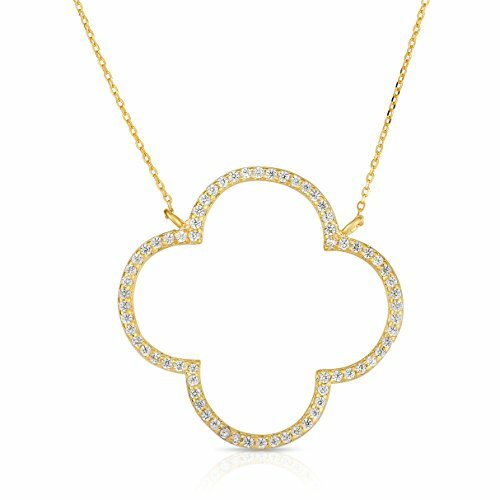 Compare prices on Open Clover Pendant at Elevelist.com – use promo codes and coupons for best offers and deals. We work hard to get you amazing deals and collect all avail hot offers online and represent it in one place for the customers. Now our visitors can leverage benefits of big brands and heavy discounts available for that day and for famous brands.